I'm Yannis and with my family in 1994 I have started my own production of marvellous kitchen tools, pens, toys and different kinds of objects all made by carving local olive wood. 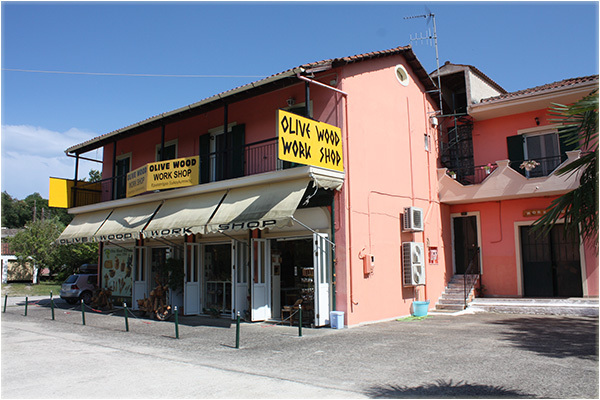 Our family-run shop is on the road to Paleokastritsa on Corfu island in Greece and it's specialised in the creation of olive wood pens. oil and other products made by oil like the soap. Every year during the winter after the picking olives we trim the top of the trees to collect the olives easier and to make a better olive oil. The trees are 300 years old and more and we do not destroy them, we use them for the olive oil and we cut only some pieces of wood to create our wood pens and handmade wooden gifts. Come to visit our big shop, you can just give a look at our works and you can buy a souvenir made in Corfu to bring home.